John was born & raised in Auckland, New Zealand & started playing the guitar in 1983. After initially playing the electric guitar for 7 years he switched to classical guitar, passing all of his Trinity College London exams up to & including grade 8 with distinction in both guitar performance and music theory. At the end of 1995 John was accepted into the Auckland University's School of Music where he studied classical guitar performance with Gunter Herbig, completing his Bachelor's degree with a double major in performance & composition in 1999. In his first year at Auckland University he won an award for his composition 'Dreamscape' for solo guitar at the annual School of Music Composition Prize Concert, also winning the best performer award for the same event. 'In 2000 he passed the graduate analysis paper in Schenkerian theory, which I teach, with an A+ doing superlative and musicianly work. In my twenty years of teaching this course such a high grade has virtually never been awarded.' - Dr Fiona McAlpine MA (Vic)., D.III cycle (Paris). In 2001 John was the first guitarist ever to complete a Masters Degree with first class honours in performance at Auckland University. Since completing his studies John has made numerous performances around Auckland, and appeared as guest soloist with the Auckland Youth Orchestra's 2001 performance of Vivaldi's Lute Concerto in D major at the Viaduct Harbour. His composition for guitar orchestra 'Rush Hour' was performed at the New Zealand International Guitar Festival in 2005, where it was recorded for Concert FM. John has played in masterclasses for many internationally renowned guitarists, including Jason Vieaux, Johannes Monno, Marco Schmidt, John Mills, Stefan Rak, and Omar Cyrulnik. 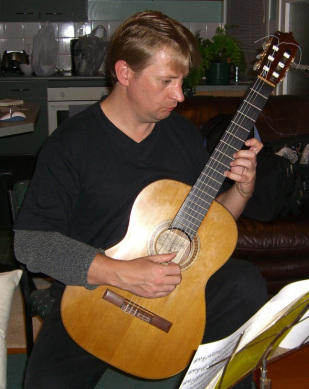 John has been a professional guitar teacher since 2001 and has taught at several Auckland secondary schools as well as privately. In 2012 John returned to Auckland University to complete a Graduate Diploma in Teaching (Secondary) in music education, which he passed with straight A's in all subjects.